Roger Wakimoto, PhD, became the UCLA Vice Chancellor for Research on July 1, 2017. Dr. Wakimoto is an accomplished atmospheric scientist specializing in research on mesoscale meteorology, particularly severe convective storms and radar meteorology. He is a former member of UCLA atmospheric sciences faculty in 1983 – 2005, serving as department vice chair in 1993-96 and chair in 1996-2000. 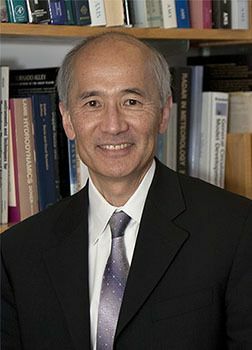 After his tenure at UCLA, Dr. Wakimoto served as the director of the National Center for Atmospheric Research (NCAR) Earth Observing Laboratory from 2005-2010 and subsequently as director of NCAR from 2010-2013. He most recently served as assistant director of the National Science Foundation Directorate for Geosciences from 2013-2017, where he led a division that supported atmospheric, geospace, polar, earth, and ocean sciences with a $1.3 billion annual budget. Dr. Wakimoto is well published in his field and has served on many panels, committees, and boards for research organizations. He has published over 100 journal articles throughout his career. He was an associate editor of the Monthly Weather Review and a co-editor of the American Meteorological Society Meteorological Monograph Radar and Atmospheric Sciences: A Collection of Essays in Honor of David Atlas. He is currently the president of the American Meteorological Society and a member of the National Science Foundation, the National Academy of Sciences, and the National Oceanic and Atmospheric Administration. Dr. Wakimoto received his B.S. with honors and great distinction in meteorology from San Jose State University and his Ph.D. in geophysical sciences from the University of Chicago. He has previously held a professorship at both UCLA and the University of Colorado at Boulder. He has received many honors, including a scientific and technical achievement award from the Environmental Protection Agency for observations of air pollution as well as the Clarence Leroy Meisinger Award from the American Meteorological Society for his contributions to understanding of mesoscale phenomena.